Are we headed for a deep solar minimum? | Watts Up With That? Are we headed for a deep solar minimum? The strange tale of Solar Cycle #24 is ending with an expected whimper: as of May 8th, the Earthward face of the Sun had been spotless for 73 out of 128 days thus far for 2018, or more than 57% of the time. 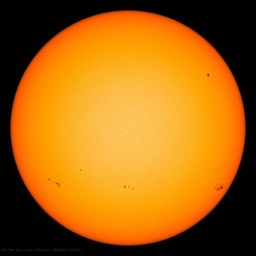 This wasn’t entirely unexpected, as the solar minimum between solar cycle #23 and #24 saw 260 spotless days in 2009 – the most recorded in a single year since 1913. Cycle #24 got off to a late and sputtering start, and though it produced some whopper sunspots reminiscent of the Sol we knew and loved on 20th century cycles past, it was a chronic under-performer overall. Mid-2018 may see the end of cycle #24 and the start of Cycle #25… or will it? The story thus far… and the curious drama that is solar cycle #24. Credit: David Hathaway/NASA Marshall Spaceflight Center. May 23, 2018 in Climate News. at least it is a testable idea. If we go through 5 years with reduced solar activity and that correlates with 5 brutal winters the idea of AGW will probably be dead. ‘and that correlates with 5 brutal winters the idea of AGW will probably be dead.’ – along with the rest of us as we freeze because we can’t afford to heat our houses thanks to renewables! If you don’t starve before you freeze. Don’t you just love a good scary story? @joegremlin – What you think causes brutal winters? What is bad weather, Alex? HAHAHAHAHA! The idea of AGW will NEVER be dead with the warmists – unless they all freeze to death (and even then I’m not sure). Trust me, we could have dry ice snowstorms in Miami and the Hockeystick team would be warning us that 59 of the hottest 60 years have been in this decade. If they freeze, you can bet yer booties that it was caused by too many people on this fragile little planet. That’s the sole cause of all their troubles. Just ask ’em. You are right there. Remember the asteroid that killed off the Dinosaurs? Now you would have suspected that the asteroid would have thrown up dust, blotting out the sun causing catastrophic cooling, would’t you? Not so! It caused Global warming, which killed off the Dinosaurs. The lesson we have to learn from this is, according to MacLeod, we are drastically underestimating the warming to come due to our evil ways and the wrath to come. Except that a return to facts-be-damned executive over reach before the five years is up gives hope to the advocacy forces of settled science and debate has ended monologue. Better to use the Hockey sticks for what they were designed for than silly charts! The way things are going, it’s hard to imagine the idea of AGW will die. Brutal winters, like any out-of-average weather phenomenon, will be attributed to man-made climate change, and the music will keep playing. And the explanation is simple. Warming causes Freezing! Do you see? What do you think is causing the long-time winter records to be broken? Or is it too early in the sequence of brutal winters to conclude anything? Let’s see if I can make it simple for you. If we experience a minimum, theory says temperature (ON AVERAGE) will be lower. Not with the ocean modes acting as negative feedbacks to solar variability. If we go through 5 years with reduced solar activity and that correlates with 5 brutal winters the idea of AGW will probably be dead. If the Sun causes 5 brutal winters, that won’t say one iota about anthropogenic GHGs, only about the Sun. Isn’t a longer term and more significant solar minimum cycle assessed to take place around 2050, of similar scale and duration as ‘The Little Ice Age’? Imo, there is some probability that after the end of this cool trend in the early 3030s that we will then see a double dip second 30+ year cool trend. That would end around the mid 2060s, and that would mean a deeper cold for the interim. As for the likelihood of such an occurrence I would say 50/50. Looking back at the history of gsm’s it does look like they alternated between a single 30+ year period which is then doubled in the following occurrence. That is speculative. I realize we had a Bray and Eddy minimum around 1350 yBP so we should not expect a grand minimum at this time. Possibly a Dalton minimum for Cycle 24 25 26. Is there a cycle longer than the 2450 year Bray cycle that could allow a grand minimum to start at this time? Should be 1450 CE for Bray and 1650 CE for Eddy. Blurry screen, heh. Sandy. Don’t which sunspot numbers they are using, the old or the revised. Just as a sidebar, I’ve been comparing the revised count with magnified SDO/HMI/ Continuum images and I seldom disagree, only seems to be that I see them disappear sooner than the official count. Might just be that I use Helioviewer. 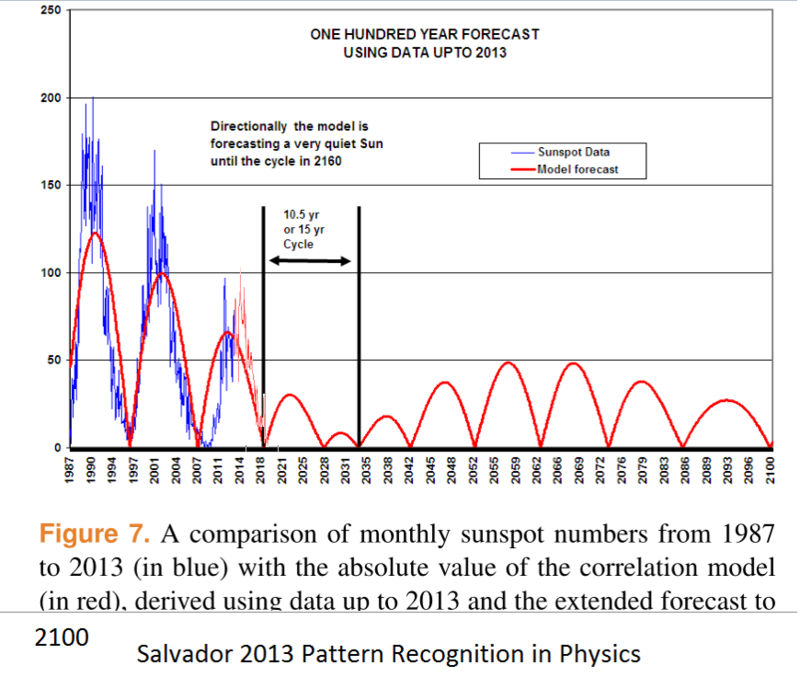 Why are you looking at sunspots as a proxy for solar irradiance, when it’s directly measured every day by satellite? Okay so the next logical set of questions would be, 1) Where are the science measurements of the shrinkage of the stratosphere in response?, 2) Where is the research and measurement of effects on the NH jet stream in response to that shrinkage?, and 3) How are the changes in the jet stream measured on summer temps and weather patterns and winters in the NH? These are important questions that go beyond the chart watching of solar minimum and do relate to actual observations of the 2009 solar minimum on summer temps and weather. Something has caused the surface wind patterns to undergo an obvious shift in patterns around 24 months ago. Since at least the summer of 2017 the jet stream has become more unstable. With increased activity in the Eastern Pacific and now in the Arctic. lf this remains in place then the swings in weather we saw during the LIA could make a return. This Summer cooler temps are most likely to be seen in northern central Russia and the NE corner of N America. Also expect an early start to the winter in these area’s as well. Humm, I would have guessed the word stronger for jet stream not “more unstable.” And stronger would imply more winter-like storm fronts in the summer making for unseasonable weather patterns and temps. lts not so much stronger, more a case of becoming more “busy” and spread over a wider area. There been a increased in activity in areas of the globe that are normally quiet jet stream wise (eg) eastern Pacific and the Arctic. lts this change in the Arctic that is getting my interest. Do you mean more meridional (I.e. loopy) vs zonal (straight west to east flow)? Meridional flow is responsible for extreme cold snaps and heat waves. Zonal flow is responsible for ‘boring’ weather. What l mostly mean is that its splitting and looping more and in general has been more messy looking. Rather like its been spread over a wider area rather then in a single stream. Yes we are getting looping but where the change has been is in the increase in branching and offshoots coming from the main jets. So in general just looking more unstable. This is causing increased activity within the Arctic, Which means its flushing more cold air out of the Arctic and largely over the same areas. lts this change is what l think is most important. I wonder what would happen if the temperature gradient between the equator and the poles flattened? Mmmm … sorta. Per CERES, the difference between the tropics (20°N/S) and the North polar region (60-85°N) is ~34°C. From the tropics to the South polar region is ~44°C, because the Antarctic is colder. You are right, per the UAH MSU, since 1979 the difference between the North polar regions and the tropics has narrowed by about half a degree, or 1.5%. However, the difference between the tropics and the South polar region has actually increased, by just under half a degree, or 1%. Go figure … in either case, the change is quite small, a mere one percent or so. Arctic amplification may make the jet more meridional sending cold air into bible belt and warm air to the pole. So many here get all frothy and indignant when that happens but thats exactly what climate scientists predict will happen more frequently. A positive feedback. Highly likely that alone would swamp any effects of a few missing sunspots. So if it doesn’t happen more frequently you will admit that the theory has failed? Let’s say the next ten years? Yes zazove, but easter bunny and santa have said they will prevent that via talking to Tinka Bell about speading fairy dust into the jet steam with santa’s ride. That link above suggests it (a wavier vortex) may already be happening. I know WXcycles, expressing uncertainty on WUWT is an anathema. zazove see above post. does the theory regarding warm air intrusion to the arctic only work in winter ? if so why? It’s complicated, but the cold core lows energized by the jet stream level flow pull the denser cold air south and warmer air fills in behind it. Sometimes they’re called polar vortices. Sorry, I was thinking of the subtropical jet. The timing of this descent into solar minimum was correctly predicted by the planetary orbital resonance model we produced and published in 2013. Many said at the time that we were wrong because low cycles are long cycles, and anyway the planets can’t affect the Sun because they are too small and far away. While it’s not proof, correct forecasts are valid supporting evidence for a hypothesis. I’ve added the 2013-2018 data to the 2013 plot/forecast below in faint red. That 4.5-year bump is going to be a hypothesis killer, I’m afraid. It already creates an alignment problem in figures 5-7 in the paper. But if it does take place, I’m in. We haven’t seen anything remotely similar in 350 years. The missing cycle hypothesis is not supported on hard evidence. If a minicycle takes place in a few years, with everybody looking, no doubt the hypothesis will get a lot of support, but I am very skeptical. I don’t think it is going to happen. Tallbloke, how about let’s settle this Julian Simon style. I will bet you $100 right now that there will be no 4.5 year sunspot cycle before 2035. Heck, I’ll bet $100 that there won’t be a sunspot cycle shorter than 6 years before then. Anthony can hold the stakes. Payable to your favorite charity if you wish … my favorite charity is WUWT. You claim that you have great faith in that forecast … now’s your chance to prove it. Or not … your choice. Willis. Look again at the plot. Do you see that in large black friendly letters, it says: “10.5yr or 15yr cycle” ? Can you see that the black double ended arrow under the words covers that 4.5year blip? 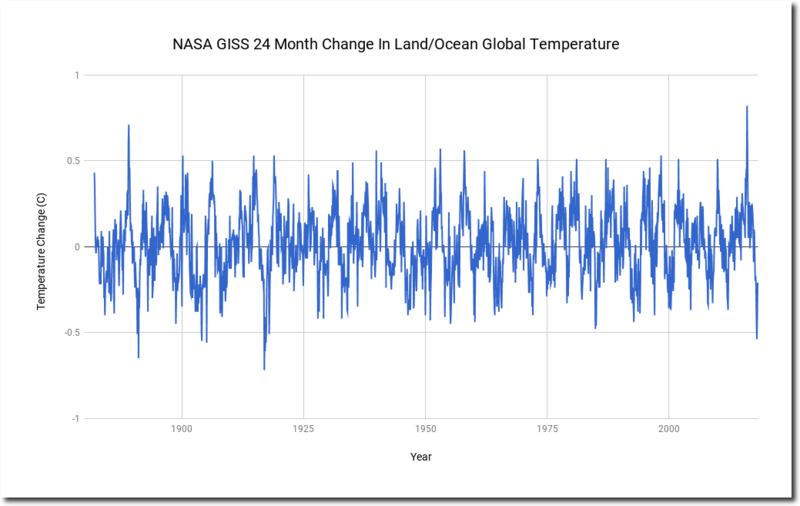 Are you aware that at the start of the Dalton minimum there was a 15 year long cycle which some eminent researchers say had a short cycle buried in the tail end of it? Go and read the I. G. Usoskin K. Mursula and G. A. Kovaltsov paper and then return for sensible discussion. some eminent researchers say had a short cycle buried in the tail end of it? The currently accepted view is that there was no such short cycle, your ’eminent’ researchers not withstanding. In addition you got the amplitudes wrong [as well as the time of the previous minimum]. My comment of the many people trying to make fools of themselves turns out to be quite accurate, it seems. Thanks, tallbloke, and yes to all (except the “eminent researchers”). I beg to disagree. The ‘missing cycle’ at the start of the Dalton minimum is comparable. I also see that in the Usoskin prediction there is undeniably a 4.5-year cycle, no matter how you try to spin it as a 15-year cycle. Willis, I’m sure Usoskin, Kovaltsov and Mursula will meekly accept your judgement that they are not eminent researchers, what with you being such a great solar expert and all. I’m not “trying to spin it as a 15-year cycle”. That’s simply what it was thought to be until Usoskin et al added in the data which showed it to be a ~10 year cycle plus a ~5 year cycle, similar to what our model predicts for the next 15 years or so. I expect it will be sometime after the event before it’s sensible to come to any firm judgement on the issue, as the sun doesn’t pay any heed to our imperfect sunspot counting methods and imperfect models. Relax and enjoy the ride. I’ve put my money where my mouth is by buying a property with some growing land Eight degrees of latitude further south from my current location. That’s a much better bet than arguing over sunspot numbers. It’s a lovely, peaceful rural location near a fabulous ancient forest and several beautiful medieval villages. Rog, you defended the 4.5 year cycle until I offered to bet on it, and now, suddenly you are ducking and dodging. As we used to say on the ranch I grew up on, you’re all hat and no cattle … you are willing to spout off, but you don’t have the albondigas to stand behind your strongly-expressed opinions. Congratulations on your purchase. As someone who likes rural living, it sounds like a wonderful place, and I sincerely wish you great enjoyment there. Willis: As someone who likes rural living, it sounds like a wonderful place, and I sincerely wish you great enjoyment there. Thanks. It’s around 4C warmer than my current location on average. Global warming just wasn’t happening fast enough for my liking. Also, being out in the sticks in the unfashionable end of France, it has wonderfully dark night-time skies, perfect for astronomy and stargazing or watching meteor showers. And the beach is under an hour’s drive away. Man, you’ve got some nerve. You ban me from your website and then invite me to read a post there … ah, well, I’ll bite, hang on … oh, of course, you’re trying to claim that I censored people with differing scientific ideas. Wow, Willis’ censor’s scissors have been busy here in the last few minutes. Good job I screenshotted relevant posts. Tallbloke, I said I would snip. I’m snipping. Don’t pretend to be surprised, it makes you look meretricious. Screenshot all you wish, I have nothing to hide. You have been wholesale deleting peoples responses to this thread to leave it looking like most people agree with you. At least I was clear direct and upfront about who was not being allowed to post at the talkshop and the reasons why. You have been removing comments altogether because they disagree with you. It’s all being recorded at the talkshop in real time. Any justification you thought you had for complaining about Joel being barred from posting is out of the window. There was scientific content in my first reply on this thread, and it also contained a reply about the situation with Joel. Your removal of it shows who the real censor is. You are doing yourself terrible damage here. Stop now. So no, Rog, you were NOT snipped for holding a different scientific view, that’s a load of bulldust. You were snipped for trying to derail the conversation just as I warned you that you would be. Censoring people who disagree with you on scientific matters is what YOU do, just as Gavin Schmidt and Tamino do. It is not what WUWT does, nor is it what I did, and it is a cowardly and underhanded action on your part. Actually I was snipped for giving a concise and logical reason why your crit of Jelbring’s paper was a non-starter. But never mind, the principle is good, so where were we? Oh yes, solar minimum and grand minima. Here’s our model’s 4000 year hindcast matching the TSI reconstruction from 10Be. Presumably the funded mainstream solar scientists have something as good or better than this? No? Here’s our model’s 4000 year hindcast matching the TSI reconstruction from 10Be. Orbital resonance in the solar system affects Earth’s climate in several ways, not solely via solar variation, so it’s not surprising to see a strong correlation between our model and 10Be based indices. Is that Steinhilber et al., 2008 ¹⁰Be reconstruction? If so yes, it is very surprising to see such strong correlation. Steinhilber’s 2008 reconstruction uses only NGRIP data for the 7363 BC to 850 AD period from Vonmoos et al. 2006. The problem is that Greenland ¹⁰Be and Antarctica ¹⁰Be data must both be used to correct for differences in transport and precipitation. Steinhilber et al. 2012 reconstruction deprecated Steinhilber et al., 2008 reconstruction, and the new reconstruction by Wu et al., 2018 is even better through the use of a Bayesian approach to redate the wiggles in ¹⁰Be to match ¹⁴C data whose dating is more precise. I recommend you update your solar reconstruction as the improvement since 2008 has been very important. Thanks Javier. It’s the 2012 data. We haven’t got around to working with the 2018 data yet. I disagree with Leif when he says 10Be isn’t a proxy for solar activity. It’s long term variation matches the long term sunspot record reasonably well. Mind you, Leif has been trying to iron the long term solar record flat for years. Thanks Tallbloke. Steinhilber et al. 2012 reconstruction is not ¹⁰Be data. It is ¹⁰Be + ¹⁴C, which is much better. It is the one I’ve been using so far, as it is the correct approach to minimize climatic contamination. My only objection is that none of the reconstructions uses IntCal13, not even the one from 2018. So there is still significant room for improvement. I don’t care what Leif says. He is promoting his views. The general view is that cosmogenic records, when properly corrected, represent fairly within uncertainty the past solar activity. I am open to alternative hypotheses to explain past solar activity and climate, but to be minimally convinced I require a level of evidence that hasn’t been reached yet. Being able to predict future solar activity would be a good start. That is why I said that the most probable prediction for the strength of SC 25 is that it will be equal to SC 17. My own results lead me to believe that the latter report putting the GB cycle at 86.5 years is the more correct one. Now, as it appears from the reports there is an anomaly. It seems that every time so often at the end or in the middle of every GB cycle (i.e. that would be DeVries cycle ) there is either a grand minimum or a grand maximum leading to either some prolonged cooling or warming. That is probably why some reports keep to an average 88 year GB cycle. In this particular case I checked and found correlation between the positions of Saturn and Uranus and the relevant turning points on (my) 86.5 year GB sine wave. Obviously, I have been thinking about what causes the ‘grand’ Minimum or – Maximum and in the end it seems the most likely explanation is that somehow the planets did not arrive in time or there is some imbalance in gravity so that we don’t have the [electrical] switch on the sun putting us in the ‘normal’ cycle. Instead we have a delayed Hale cycle. Must say, I have been praying that we won’t have a grand Minimum. That would be a disaster. Anyway, all indications are that we did not miss the switch. Never mind all of that. Do you think the position of the planets is cause to the climate on earth? 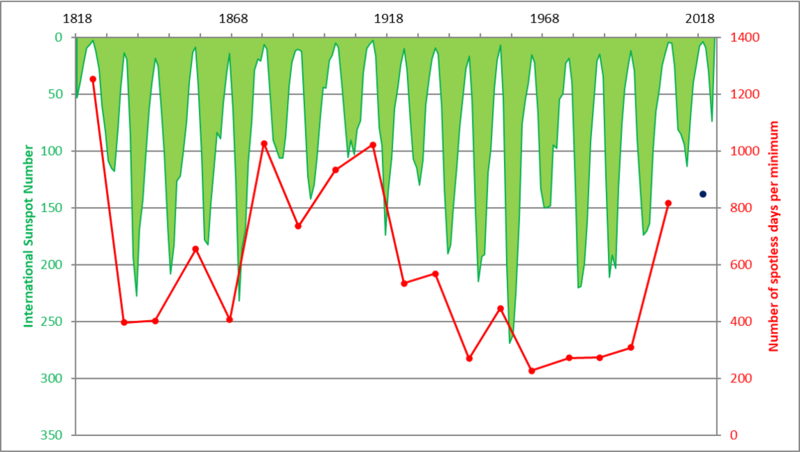 I personally don’t see evidence of a ~ 87-year cycle in sunspot records for the past 350 years. In my opinion the Peristykh paper is not convincing. Yes, but not in the sense you are implying. The planets, and particularly Jupiter, are responsible for the orbital changes that produce the coming and going of glacial periods. As such the planets are cause of the most important climate changes on Earth in the 10⁴-10⁵-year time-frame. Whether they also rule over solar activity changes, there is insufficient evidence for me to support that hypothesis. I cannot respond now. I will respond later. SSN is not my favorite but even here you can draw a binomial [representing the average SSN] from 1927 coming to a dead end stop in 1971. From 1972 you can draw a binomial again down to 2014 representing the average SSN. Those two binomials are like mirror images. possibly by the planets, IMHO. I first stumbled on the GB cycle checking maxima in Alaska, going back to 1940s. I think for anyone wanting to see the GB cycle I would recommend looking at maxima and minima, and how this changes. Best is to set out K/annum versus time, i.e. the derivatives of the least square equations over at least 4 periods versus time. 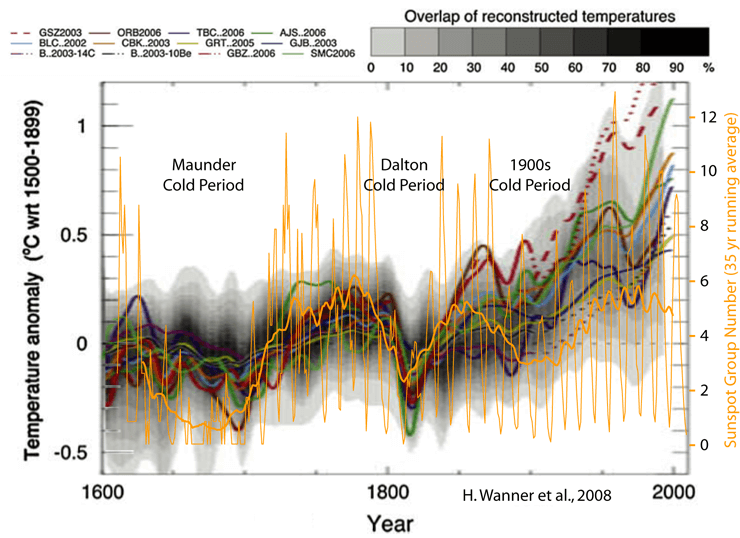 See how the speed of warming/cooling changes over time. Sorry Henry, I am not following you. Looking at data since 1940 means you can only have one oscillation, so you won’t see a cycle. The way Gleissberg defined the cycle (7 solar cycles, 78 years), does not exist. Since then each author defines it differently, and any periodicity in the ~ 50-100-yr range gets named Gleissberg. Not a very good sign. Then every short solar periodicity, 11, 52, 104, and even 208-year periodicities can be clearly seen in the sunspot record, but not the 87-year one. Whatever it is that you are finding at ~ 87-year, it does not appear to be a periodicity in solar activity. At least as we currently understand solar activity. true enough. I don’t have a whole sine wave cycle….but the overwhelming evidence is on my side? Note that this investigation was done quite a few years ago and I assumed the 88 year mentioned in the P. report was the correct wave length. It turned out that we had the double solar polar switch in 2014, suggesting to me the cycle is 86.5 years, as also mentioned in the 2 report that I quoted earlier. note that the straight line drawn by Leif is of course incorrect. It shows a trend but it does not represent the average measured figures. I say that you can draw binomials top to bottom (hyperbola) and bottom to top (para bola) to give you the correct average north and south polar filed strengths. Dead end stops are 1971/2 and 2014.
henryP, thanks for the papers. I always wonder what the patterns would look like if they were totally random. Fluctuations right down to the smallest scales in the sun, building up and dissipating.. The continual rotation of the Sun… Is the Sun’s rotation slowing? Many a child has made a model of the solar system. If you take a penny as the size of the Sun then Jupiter is about the size of the O in the ONE CENT on the tail’s side. At this scale this Jupiter is 5 feet away from the penny. Of course space is very ‘empty’ and any small effect is not blocked (opposed) generally speaking, and the effects are endlessly stronger and weaker with resonances. HenryP, thanks for the papers. I always wonder what the patterns would look like if they were totally random. Fluctuations right down to the smallest scales in the Sun, building up and dissipating.. The continual rotation of the Sun… Is the Sun’s rotation slowing? Many a child has made a model of the solar system. If you take a penny as the size of the Sun then Jupiter is about half the size of the O in the ONE CENT on the tail’s side. At this scale this Jupiter is 5 feet away from the penny. Of course space is very ‘empty’ and any small effect is not blocked (opposed) generally speaking, and the effects are endlessly stronger and weaker, with resonances. Willis, while you’re accusing RealClimate of banning you, note that WUWT bans plenty of people because they accept and communicate the AGW consensus. The larger problem with your prediction for SC25 there is that your SC23/24 minimum date of 2018 is too early. In the last sentence, should “regulated” be “relegated”? The 2008-2009 solar minimum was a surprise to astrophysicists at it was deeper and longer than anything seen previously by modern scientists in the satellite era. The 2018-2019 solar minimum could also hold some surprises. The number of spotless days correlates very well with solar activity. Unless the correlation is to be broken, there are a lot more spotless days in store for current solar minimum. I would guess somewhere between 600-800 more spotless days for current solar minimum. That’s over 2 more years of solar minimum. With a WUWT article about the issue every couple of weeks, that’s about 50 more articles. Save some ammo, Leif. Already several in this very post. By then we will all have post traumatic svalgaard disorder (ptsd… ☺), not just Javier! Just 19,000 years ago, this past November, it was freezing cold and the ice over Manhattan was a mile thick. One can easily see that 72 years from now we will be broiling in heat as the oceans boil. Sea food will be dirt cheap as fully cooked fish pop out of the ocean onto your dinner plates. “One gets such wholesale returns of conjecture out of such a trifling investment of fact.” Thanks for that, Andy. I was wondering where the Twain quote was located. What a great writer and person. That is truly a golden quote by Mr. Clemmons. Andy May, thanks for the whole quote. Copied & saved. Javier, you appear to be using the old sunspot numbers in your graph above … I can’t replicate your graph with the SILSO daily sunspot numbers. It is not my graph, Willis, It is SILSO’s graph. I trust they have used the correct sunspot number and procedure. If you believe they have not, you should inform them. Thanks, Javier. I’ve figured out what they’ve done. They are comparing spotless days with the yearly average spot count, and I was comparing spotless days with the daily spot count. There are a number of theories afoot, with just a few centered on mechanism while most others are centered on cyclomania. I hang my hat on mechanism, not references back to a previous low activity period. Given the way the Sun gets somewhat bound up and gives us hints about that based on surface activity, the previous cycle should tell us a bit about the coming cycle. The Maunder Minimum would not be able to inform us about our next cycle. Pamela Gray – that’s right, if I look back at the old patterns and find a pattern similar to this one in the much-to-be-desired-old-data, it’s a great feeling. A few years ago we had something similar going on here at the weather station. Farmers came in with reams of old records and tried to find patterns in the surface reflections of our 700 mb/height charts. They found quite a few. But when we actually looked at the causes of the patterns – all the causes (and lifecycles) were different. No two causes were the same, This was quite disappointing, but quite understandable. Gee, it would be nice if we could just pop the sun into a nice little lab somewhere and try all our theories on it. I spent a good part of my career trouble shooting and inventing solutions. A lot of it involved dreaming up mechanisms that fitted the facts. I paid particular attention to the inconvenient facts, the bits that didn’t fit. These were the most important clues because they indicated that the current thinking needed to be modified. But these were the ones most often ignored by others because they were inconvenient. Pamela is right. Consider every possible mechanism and explanation. If you have every possible one, then know that one of them is right. It may not be the one that you initially expected. In 1949, Frankie Laine had a hit song with “That Lucky Old Sun” ( had to look it up). The lines included “Nothing to do but roll around heaven all day”. Now he is doing less of it. CAGW has been fraudulent from the beginning. Can you imagine coming from a science background and confecting a theory with only one influence on climate change–CO2? In this case, the passion to control people overwhelmed the need for probity. Also, there is the money side. In the early 1800s, Goethe made a pertinent observation that included that men of science would “worship error if it afforded them a living.” From memory, but it is close. As Kepler was discovering that planetary orbits were elliptical, his government paid him for casting horoscopes. He needed to make some money. When he was a student his tutor taught that the solar system rotated around the Earth. He had to make a living. Privately, he was a Copernican. The only way for governments can be made to stop funding bogus science is to run out of money. Or by the will of the people as this popular uprising continues to become more influential. The last such uprising turned astrology into astronomy and alchemy into chemistry. In the late 1500s, the biggest bank at the time published a newsletter and in one of them noted that only governments were foolish enough to fund alchemists. Today’s form of alchemy also serves the state. Interventionist central banking whereby credit is confected out of “thin air”. The state has employed in economic and “science” the only theories that will add to its power. The next recession will take apart the notion that central banks with trillions of taxpayer money can prevent bad things from happening. As solar activity continues to diminish, cooling will disprove that the state can set the “perfect” temperature of the nearest planet. Another Great Reformation will be advanced. The last one began to become successful in the early 1600s. England had the best experience in it. Europe with the “Thirty Years War” had a bad time reforming unlimited government. A new model of the Sun’s solar cycle is producing unprecedentedly accurate predictions of irregularities within the Sun’s 11-year heartbeat. The model draws on dynamo effects in two layers of the Sun, one close to the surface and one deep within its convection zone. Predictions from the model suggest that solar activity will fall by 60 per cent during the 2030s to conditions last seen during the ‘mini ice age’ that began in 1645. … Results will be presented today by Prof Valentina Zharkova at the National Astronomy Meeting in Llandudno. … Zharkova and her colleagues derived their model using a technique called ‘principal component analysis’ of the magnetic field observations from the Wilcox Solar Observatory in California. They examined three solar cycles-worth of magnetic field activity, covering the period from 1976-2008. In addition, they compared their predictions to average sunspot numbers, another strong marker of solar activity. All the predictions and observations were closely matched. “Combining both waves together and comparing to real data for the current solar cycle, we found that our predictions showed an accuracy of 97%,” said Zharkova. “Effectively, when the waves are approximately in phase, they can show strong interaction, or resonance, and we have strong solar activity. When they are out of phase, we have solar minimums. When there is full phase separation, we have the conditions last seen during the Maunder minimum, 370 years ago. *So, a 60% reduction coming to a star near you. Yes; and the Earth’s spin axis is tilted 23.5° with respect to its orbit around the Sun. A third axis may be imagined perpendicular to the plane of the Earth’s orbit. No two of these three axes need be colinear, nor are they. Zharkova’s model has already been shown wrong by Usoskin. It doesn’t properly hindcast, so it is nearly impossible that it can properly forecast. @Javier- could you give me a pointer to the Usoskin document that refutes the Zharkova model? Also the fact that we are moving into new solar regime suggest it would not be that important to hind cast accurately if the forecast was accurate. Usoskin, I. G. (2017). Comment on the paper by Popova et al.“On a role of quadruple component of magnetic field in defining solar activity in grand cycles”. Journal of Atmospheric and Solar-Terrestrial Physics. @Javier- Thanks for the link. The main complaints by Ilya Usoskin are they introduce ‘new stuff’ and they missed the Sporer min. However, the Zharkova hind cast does predict the Dalton, Maunder and Wolf minimum. It also covers the conventional LIA. It does not show the big Sporer minimum but it is possible the Sporer minimum might have been due to another cause. All in all, to me, sounds like ‘sour grapes’ or NIH ( not invented here). The progress of canonical science is often held back by torchbearers, until their torch goes out. Well, no doubt evidence can always be interpreted in different ways. Personally, Zharkova’s model is incongruent with my analysis of historic cycles, so either she is wrong or I am wrong. Or as Leif would say both are wrong in different ways. We’ll see. @ interzonkomizar… I would say very unlikely because this Warm Period is not over by any means. That will make the difference as to how deep the cool trend can go. When this cool trend finally ends the warming will resume through the next century from my outlook. @Goldminor- what I have seen of Bob Weber’s Figure 10: F10.7cm flux shows ocean cooling since 2004, ond Ole Humlums chart showing North Atlantic cooling, I expect after the coming cold cycle, whether it’s 20 or 80 years long, the heat left in the ocean will not bring the air temperature back up to what it is now, 14.5 C. Mabe 13.0. I don’t expect to see higher temps than what has already occurred either. I think that we have just lived through the peak of the Modern Warm Period. The analog in my opinion is what the JG/U 2K tree ring study shows. It clearly shows both the MWP and the RWP, but one aspect stands out when studying the graph. That is that in both Warm Periods, temps ramp up to a peak somewhere during the 500+year length of the WP and then trail off. What do you expect in the short term as to ocean conditions, ssta/sst? Based on models. We will see if this holds up any better than the CAGW models. WR: Is there anything known about an eventual precession or obliquity of the sun’s axis? A good and pertinent question to which I too would like an answer. There is a 974 year cycle of angular momentum in the solar system, driven by the outer planets, which hold 98% of the system’s angular momentum. If the planets do have any effect on the Sun, we might expect its polar axial orientation to precess at that frequency or a resonant multiple of it. @ tallbloke… never heard of that. Note how that could well fit with the 550 +/- warm followed by 400 +/- cool pattern which I see when looking at long term graphs. The Earth’s poles are more ‘flat’ than the Earth is at the equator because of the centrifugal force. Being a gaseous object, the Sun must have a similar form, probably even more pronounced. We always think about the sun as radiating equally in all directions, perpendicular to its surface which is (was) supposed to be perfectly round. But what, if the Sun is not exactly ‘round’ and what if there is a certain precession of her axe? The sun will not shine equally in all directions and in case of obliquity or precession variations there might be a ‘wobble’ in radiation, for example into the direction of the Earth. @Tallbloke- could you provide a link to a chart or post re the 974 yr angular momentum cycle? I would like to check for climate effects. Thanks. Never mind, goog got it. Just have to ask right question, heh. Is the Sun’s rotational axis REALLY tipped 7.25 degrees relative to the ecliptic? Or is the Earth’s orbit (and thus what we call the ecliptic) tipped 7.25 degrees? It’s tipped 7.25 degrees relative to the plane of invariance, not the ecliptic. No two of these three axes are colinear. Tallbloke! You gave me a new orbital mechanics concept to study! Now, the plane of invariance sounds like it is based just on the orbits of the planet’s (and their effect on the barycenter) but if one of the planet’s (especially Jupiter) had its orbital tilt changed, that would change the plane of invariance too. I wonder, if you really wanted to set an ‘True’ 0° up for the Solar System, to compare everything else to, whether you wouldn’t be best useing the Solar Systems ‘Direction of travel’ as it orbits the Galaxy? I have read article after article about sun spots. Honestly, it is one of the things that brought me here to this site a decade ago. From what I have seen, as much as I want there to be, there seems to be little correlation between sun spots and temperatures on earth. This doesn’t come as a shock to me as it is a secondary driver, not a primary. What I mean by this is that, according to theory, less sunspots are indicative of lower solar activity, meaning more cosmic rays strike the earth. More cosmic rays are supposed to make for more clouds, which makes for less sunlight reaching the surface (read ocean) which slightly decrease the temperature of the earth. That takes two steps, each one caused by the previous but not interrelated. Meanwhile TSI is a primary driver. Now TSI does go down slightly in a minimum and up slightly at maximum. 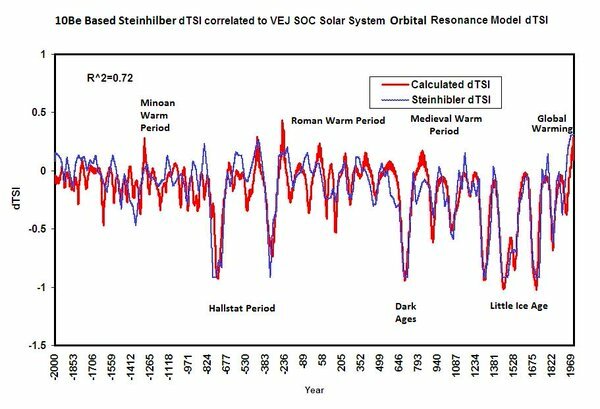 My personal theory, for which we have no data so it is only a guess, is that during the Maunder minimum the same forces causing such a long minimum also caused a further drop in TSI. It wouldn’t take much of a drop to greatly affect earth’s temperatures. But that is just a silly guess. Meanwhile TSI is a primary driver. TSI is the primary driver of the baseline situation, but it is unlikely to be the primary driver of climate change, because it is nearly constant, with a change of only about 0.1%. If the Sun is responsible for a significant part of climate change, it is unlikely to be only through changes in TSI. Focusing only on TSI is like refusing to consider any other solar change that might affect climate. 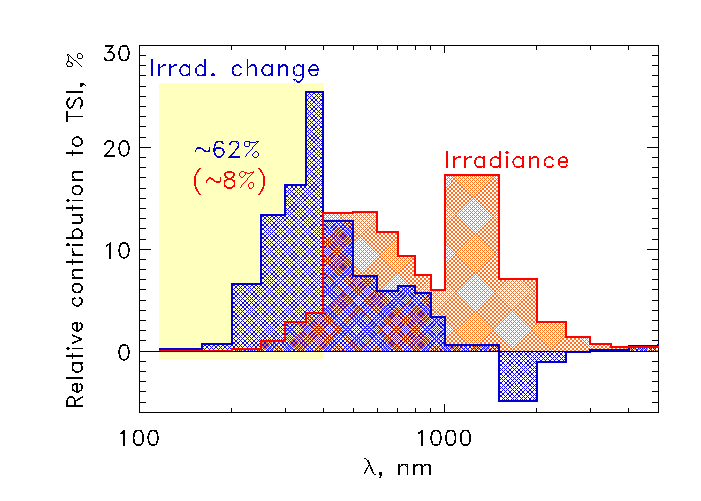 @Javier- it is true that total TSI may only very 0.1% , that is for the total Spectrum from EUV to Far Infrared. The EUV up to Blue Light may vary 6% by itself which is more inclined to warm the oceans, since it penetrates much deeper and carries more energy. This is often overlooked and I don’t understand why. Yes, spectral variation is quite different from TSI variation. What changes with the solar cycle is the lower part of the spectrum. The higher part of the spectrum is actually anti-cyclic. If you want to disregard a solar effect you choose TSI because that is what shows less variability. I understand what you are saying Javier, but, as much as I want there to be, I have yet to see any real correlation between sun spots and temperature. Meanwhile, I see a lot of correlation between global temperatures and the ocean cycles, which are affected by changes in temperature of the water. This is a bit of simplification, and I hope that we can find proof of sun spot activity influencing temperature but as much as I want it to be, we have yet to find the smoking gun. I understand what you are saying Javier, but, as much as I want there to be, I have yet to see any real correlation between sun spots and temperature. The problem is probably your initial assumption. 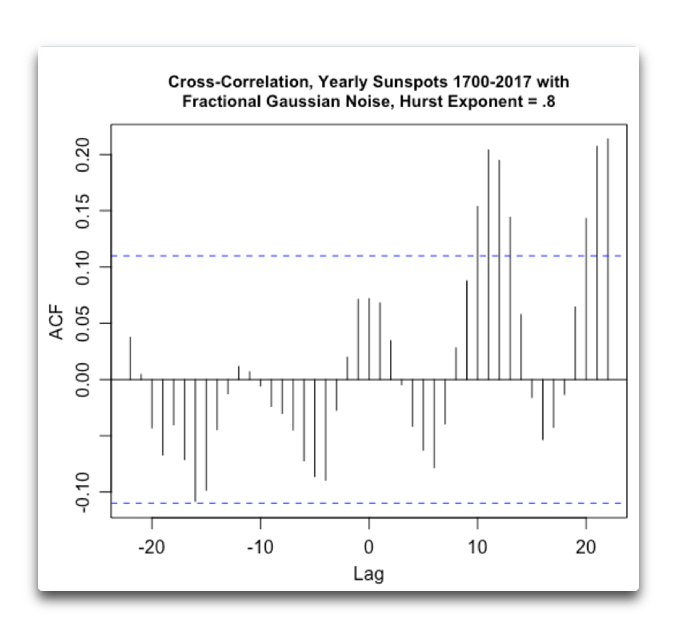 Why should there be a correlation between sunspots and temperature? Changes in solar activity should correlate better with changes in temperature (ΔT), not with temperature. And don’t forget that since several things affect temperatures, you should not expect a very high correlation. Just that temperatures do generally move up when there is a long period of above average solar activity, and move down when there is a long period of below average solar activity. That works quite well. All I can do is stubbornly insist TSI doesn’t tell us everything there is to know about the Sun’s affect on the Earth’s climate. GSN doesn’t tell us everything there is to know about the Sun’s affect on the Earth’s climate. 10.7 cm flux doesn’t tell us everything there is to know about the Sun’s affect… But it has to be the Sun, there is no other source of energy available to our Earth, and you can’t get a change of temperature unless or until you change the amount of energy that reaches the temperature measuring location. And in this case I don’t care about the minor mild difference between a mythical average temperature of today and one calculated in 1930s, I’m talking about the difference between our current productive climate compared to an Ice Age climate that is not only cold but also with greatly reduced precipitation because so much of the moisture is locked up in Ice Sheets. I like the basis of the Svensmark hypothesis… picture a sphere of solar output around the Sun, forming a sort of bubble (with no definitive boundary but a rapid drop off at its outer limits) of protection that drops off at about the distance of the Earth’s orbit. At higher levels the Earth is completely enveloped by the bubble and gets maximum protection. It would take only a minor decline, that is shrinkage of the bubble, to leave the Earth completely exposed receiving minimum protection. And that’s how a 0.1% reduction of the Sun’s output could produce a much larger swing in temperature (used as a proxy for climate). Now I don’t know what makes up that bubble nor what it protects the Earth from, I leave that to those of you who research such things. But that’s the kind of theory that could fit the facts. But that’s the kind of theory that could fit the facts. Except that there isa bubble, but with a boundary at 100 times the distance from the sun to the Earth. So, your theory does not fit the facts. Then we’re looking for a different bubble. And since we not only don’t know what we’re looking for, we’re not sure where we lost it, either, so currently we’re gazing around over here under the street lamp cuz that’s where the light is better, hoping we recognize when we see it. The fact there is a bubble, even though it’s the wrong diameter, I think lends credence to the idea, it’s just that we’re looking for something else, at the correct radius. Possible? Is there somewhere I can easily access solar data? I’m looking for things like sunspot and TSI data, on a monthly basis, as far back as possible. How is TSI known back to 1800? How consistent are these data? How reliable? Thanks… I’m a meteorologist and climatologist… still clueless about astronomy. When I went to school, it seemed mostly irrelevant to my fields of study. Now I wish I knew more. If you run a search Silso should come for the sunspot data, and PMOD for TSI data. counts, usually by month, back into the 1750’s. in predicting future solar activity. Can the 2 recent Cyclones in the Arabian Sea be attributed to climate cooling or ocean cooling due to a quiet sun? Absolutely not! It is clearly from localized CO2 output, given the oil comes from there anyway… All climate change has to be attributed to CO2, dontyaknow? I thought Lief earlier had said we are already in cycle 25, based on the polarity of some of some the spots we have been seeing, and that there is usually an overlap of the cycles. Do I mis-remember? my name is not pronounced as ‘leaf’, but as ‘life’. yearbut Lie-f produces correct prononsi … pronowns … proneunx …. it makes us say it righter-er. Dear heavens, could you get more childish? You can’t fault the man on his science, so you sink to this ugliness? For shame. No, you don’t ‘mis-remember’. solar cycles do, in fact overlap. Each lasting some 16-17 years. A new one starting some years before the old one slowly peters out. For convenience, an artificial ‘minimum’ can be calculated as the time where the sum of the number of sunspots for the overlapping cycles are at a minimum. One can ague that the influence of sunspots would depend on that sum, but for studying [and forecasting] solar activity each cycle must be treated as a unit. Think of Leif Erikson, the Norse who discovered North America. Just the way I discovered New York. It wasn’t important until I got there. “Are we headed for a deep solar minimum?” Short answer: certaintly not, the polar fields point to a SC25 similiar to SC24, not as strong as the average but no sign of “Maunder”. Hot linked Journal! Impact factor? I have 4 (!) theories for the start of cylcle 25… The other 2 are at an official journal… Don’t say which one, because Leif will want to keep it unpublished! Many a climate change-denier will at least concede that the current climate of the Earth is indeed changing, though they’ll question human activity’s role in it. The rather ominous fact is, taking only current solar activity into account, we should be in a cooling trend right now, a signal in the data that anthropogenic climate change is working hard against. The problem is Dickinson doesn’t recognize reality. As you can see, once we look at all the data the correlation falls apart. 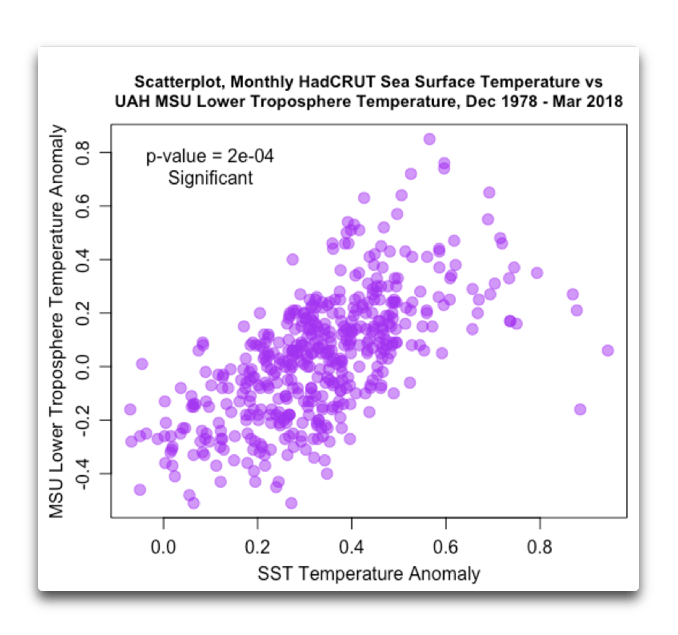 The TSI data is NOT related to the sea surface temperature. 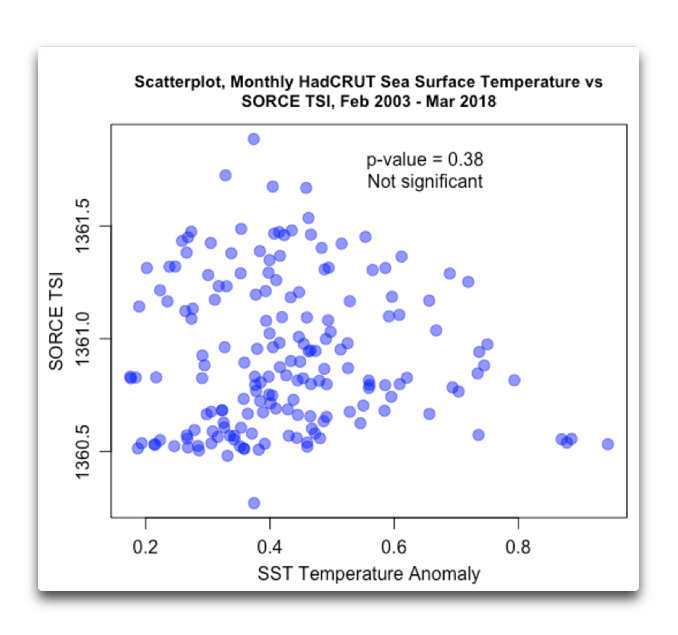 The same is true for SORCE versus the HadSST sea surface temperature. Willis, there is no accounting for the rise and fall of solar cycle TSI-driven ocean heat accumulation-depletion in your plots. SST is a function of TSI powered ocean absorbed solar energy accumulation/depletion over time. The heat in the atmosphere is a function of heat released by the ocean, per your third figure. The heat in the equatorial ocean is modulated by solar cycle TSI, and overall SST is modulated by equatorial ocean heat content. Looks like I’ll have to make a set of TSI-UAH and OHC-UAH cross correlation plots, ie figures 18.1 & 18.2, to further make this point. So, Willis, an honest question for clarification. Is the temperature of the lower troposphere a result of SST or is SST a result of lower troposphere temperature? It appears that the heating of the top ocean layer by the sun is what regulates our temperatures on this planet. 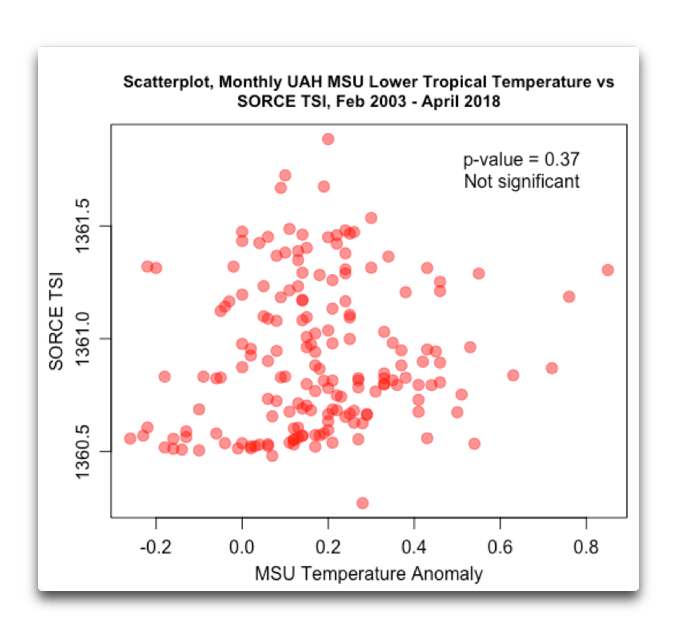 If SST is not related to TSI, then what heats up the ocean? Honestly? What other options are out there? However, this is far from the complete picture. The amount of downwelling solar radiation that gets absorbed is affected by such things as clouds and wind. The amount of downwelling longwave radiation is affected by clouds and total precipitable water. And this is only one side of the equation, the gains. The ocean loses energy in a number of ways, including radiation, conduction/convection, and evaporation. These in turn are affected by wind speed and temperature. Finally, thunderstorms act as giant refrigeration units delivering cold air and cold water to the ocean surface. Also, surface temperature is a function of the rate of overturning of the “mixed layer”, which in turn depends on winds and the balance between solar and longwave radiation. Finally, the usual claim is that the ocean temperature or other surface variables (sea level, air temperature, etc) are affected by the changes in solar output (TSI, EUV, magnetic fields) related to the ~11-year sunspot cycle. I’ve never found any solid evidence for that. the usual claim is that the ocean temperature or other surface variables (sea level, air temperature, etc) are affected by the changes in solar output (TSI, EUV, magnetic fields) related to the ~11-year sunspot cycle. I’ve never found any solid evidence for that. By visual examination alone, the statistical significance of so many highly correlated indices for 37 years (the length of the CDR TSI record I used in my Figure 18 above), as all the climate indices are with solar cycle TSI (dark red), and obviously with each other, can be estimated to be in the .95-.995 range. TSI is highly significant to climate. The only way you can deny this is to block it out. This must be demonstrated experimentally: Hypothesis – downwelling infrared radiation of the frequencies expected from Carbon Dioxide molecules ‘increases the temperature’ of the oceans. Precisely the opposite should happen as evaporation would be increased and the surface of the oceans would get cooler due to the loss of latent heat of evaporation. Nobody will attempt this extremely simple experiment of course as to do so would result in falsification of ‘global warming’. As 75% plus of the Earth’s surface would be cooled by downwelling radiation not heated by it and the evaporated water vapor would convect up and release the latent heat higher in the atmosphere as it changes state to water then ice. As you repeatedly point out Willis. Thanks, Doc. As a man who has actually built refrigeration units from the component parts, I can assure you that thunderstorms are indeed operating on the same cycle as your household refrigerator. A refrigerator uses a “working fluid”. The working fluid evaporates in the area to be cooled, say the inside of your home refrigerator. The evaporation cools that area. Then the working fluid, now in the form of a vapor, is moved to another location, where it is cooled until the fluid condenses. Finally, the working fluid is returned to where it started, completing the cycle. The power is provided by electricity. Note that this is precisely what happens in a thunderstorm. The working fluid is water. It evaporates at the surface, cooling that area. Then the water vapor is moved to the troposphere, where it is cooled until it condenses and is returned to the surface where it started in the form of rain … just as is happening in your household refrigerator, except the power is provided by the sun. You seem to be under the misimpression that thunderstorms do no work, when in fact they are giant heat engines … let me recommend once again my post on this subject, “Refrigerating Nairobi, Air-Conditioning The Planet“, wherein I discuss this question in detail. As you can see, this sure looks like there is a correlation. The blue line shows the correlation that would normally have to be exceeded in order to be considered significant … but this is just random noise. And as a result, you cannot determine if the results are significant “by visual examination alone” as you say. The only way to do it is by the Monte Carlo method. Generate say a thousand examples of fractional Gaussian noise with a Hurst exponent equal to that of your target dataset. Then run your cross-correlation on all of them, and calculate the level of maximum correlation that is only exceeded by 5% of your examples. That’s the level you need to exceed to have significance at the p-value = 0.05 level. And even that may not be enough. Try, for example, doing a cross-correlation between sunspots and a waveform consisting of a single pulse (e.g. something like 0,0,0,0,0,0,0,1,1,1,1,0,0,0,0,0,0,0). You’ll get a whacking great correlation … but it is meaningless. Willis that’s an interesting non-sequitar but as I see it the CC plots speak loudly and clearly. No reason to dial anything back. As a mechanical engineer too, yes thunderstorms are a heat engine. That’s why they are not a refrigerator. The refrigerator is a heat pump, the opposite of heat engine. In heat engines, heat flows from hot to cold body and you get work output. In heat pumps, you input work to make heat flow from cold to hot body. That’s why the name “heat pump.” Copied from water pump. Water flows from high elevation to low elevation by law of gravity. Water pump reverses the flow from low elevation to high elevation by doing work (pumping). Heat flows from high temperature to low temperature by 2nd law of thermodynamics. Heat pump reverses the flow from low temperature to high temperature by doing work (gas compression). Inside the ref is cold because heat is continuously being “pumped” outside the ref where temperature is hotter. Thunderstorm is not a refrigerator because heat flows from high temperature (surface) to low temperature (high altitude) and you get work output (increase in potential energy of rising warm air). It is a heat engine. Cooling tower is also a heat engine. Bob data that is supportive of what you propose which I am on board with. It is happening now as we speak. Willis, as an engineer when doing process control I look at underlying causes. Sometimes, when I make the mistake of looking for direct correlation I miss the true underlying cause, usually because it is hidden by a feedback loop or multiple causes that appear to be larger but really aren’t. So I look at this as a system. There is a primary source of all heat on this planet. It is the sun. Non-negotiable. Turn off the sun, and we freeze solid like Europa. From what I see, the engineer’s viewpoint, this is the primary driver of heat. Everything else is secondary, because if the sun were to turn off tomorrow, all those processes would also stop. If anything else stops, the sun is still delivering its heat. Like any other system that relies on a primary driver, if that primary driver provides less or more, the secondary processes also provide less or more, although this may be in the form of a feedback and so actually go in the opposite direction, i.e. sun radiates more heat, ocean’s evaporate more, more clouds form. The data won’t always show the correlation back to the primary driver because it is hidden by the multiple upon multiple feedbacks and accelerants in the system. I’m not saying your wrong, I’m just saying that the interpretation of data is not always right and you have to peel back the layers of the onion to get to the right information. But then, I could be wrong. Knock-out for Leif is approaching! I’m only interested in how this low sunspot count will or may affect the weather, which affects crop and livestock production (chickens are livestock), and also affects my monthly household expenses. These are practical matters, since our weather is a seasonal affair. You can argue solar physics all you want, but if you get down to the nitty gritty of it, it’s whether or not you will have to buy extras of everything because of early winters and late springs (weather), or how much it’s going to bump up your heating (gas) bill. I’m still running the furnace, but to the areas 35 miles south of me, the weather is more close seasonal averages. However, in many areas crop planting is late owing to colder than ‘normal’ weather. The hardware store did not put out plants for sale until last week. Too cold. I have yet to see anything much in the way of bugs, period. This has also happened repeatedly over the last five years, but it gets later every year. These are symptoms of a change that is more subtle than a lack of sunspots. If it’s going to be for a very long time, we need to prepare for it now, not at the last minute. lf you live in the NE corner of the USA, then recent jet stream activity suggests cold and early starts to the winter along the spring snow lasting longer into the season. During the summer big swings in temps and the weather look likely. taxed – the notable winters in your area and, for the same reason, the whole Eastern US have resulted from a shift in the storm track and even the high-level pattern. What caused this? It’s a very slight effect in the global Rossby wave pattern. A delayed effect of the warm sun? Insufficient outflow due to GHGs? Your winters will probably continue to be like this. In a complicated sequence the decreasing temperature gradient toward the north has been allowing cold core low circulations with their very cold air to invade the Eastern US and Western Europe. This mechanism begins to develop after the December solstice and it becomes recognizable by the end of January. It doesn’t get washed out by the returning sun until late April. It’s very interesting if this is what’s really going on..
…It’s interesting for meteorologists, because it involves the Arctic Jet and Polar Jet and the role of high-pressure systems in the Arctic and SSWs. l have taken a interest in the global jet stream and its role in climate change since about 2012. As l have always believed it was a key factor in climate change and ice age formation. lts now looking like that increased jet stream activity in the Arctic is a climate game changer for the NH. Because with this increased activity in the Arctic there is a increase in Polar air pushing down across the land masses of N America and NW Russia. Just like what happened during the ice age. Yes l agree changes in jet stream activity in the Arctic is a climate changer. Because weather the jet stream is pushing up into the Arctic over the Atlantic ,Pacific or NE Russia. Polar air most often gets pushed down across N America and/or NW area of Russia. Just like what seemed to happened during the ice age. It is interesting that the warm(er) Alaska and the very cold East Coast matches the pattern of the Laurentide Ice Sheet. I’m in the upper Midwest, the Great Lakes region. Late spring, with snows up to 3rd week of April (photos recording this) and birds not finding food resources are weather signs in the short term. In the long term, they signify other responses. Another sign that is telling me something is off kilter is that the robins, which are generally rather fat, are skinny this spring and having trouble finding food for their broods. What we are getting up here is a dip of cold air from up North. When I’ve checked the MODIS images, e.g., last week, the snowfields showed no sign of meltback in northern Canada below Hudson’s Bay. If we’re due for a Maunder Minimum – and I do recall NASA’s concerns re: that very thing, during the 18-month lapse of solar activity from 2005 to 2006 – it can also be punctuated by a return to “normal” solar activity that ends too soon. I take nothing for granted any more. But as I said, if it silences the ecohippies and their ilk, it’s fine with me. Where the change that is taking place that will effect the Great Lakes area ls the increase in jet stream activity in the Arctic.lts the main reason for the cold in that area this spring. This years weather has now convinced me that increased jet stream activity in the Arctic is a climate game changer for the NH. Because when this happens NE N America and NW Russia are the areas that get hit hardest by cold air pushing southwards. l now believe its this change in the jet stream patterning along with orbit change that is the trigger for ice age formation in the NH. Old men used to go to town, sit in front of the general store, play checkers, smoke, and talk weather. In winter they would go inside by the stove. Not saying you are an old man! Anyway, our US NWS posts charts that can be used to check how this year’s weather compares to previous year’s. Further, I’ve got garden plants growning, flowers blooming [tulips-done; iris-now in full bloom], strawberries doing well; little green cherries on the trees, and so on. Other trees and plants – natives – are all doing as expected. Nice year, so far. Weather is what climate is made from, and thus must always have an effect on what climate will be when the sums are done at the end of the arbitrary period of choice. Climate is arbitrary and abstract, weather is not. Sara, sunspot cycle 25 will rapidly increase in strength… I will write an extra paper on that one… So no Maunder minimum yet! Okay, I will watch for that. I checked the NASA SOHO website for the current spots this morning. There were two, VERY small in size, nearly invisible. I will be watching the skies for ice dropping out of cirrus clouds in July and August. I’ve seen that before, every year going back to 2005 when this spotless cycles grouping started. No one knows what the sun is going to do or not do. No one knows how long solar cycle 24 is going to be and no one knows how deep this minimum will be, meaning how long will the solar flux stay at 90 or less. I do not care about sunspot numbers per say. With that said, it seems like an uptick is taking place with solar cycle activity now which lends evidence that this cycle is not ending anytime soon. I have maintained for years now which many have not paid attention to , that in order to have solar exert a climatic impact that is more significant two conditions must be present. CONDITION NUMBER 10+ YEARS OF SUB – SOLAR ACTIVITY IN GENERAL. conditions for several decades, the modern maximum. must be meant and sustained for a period of time. Those solar parameters having values equal to or lower than the solar values that take place in typical solar minimums within the so called 11 year sunspot cycle, and longer in duration. It looks like this is now occurring. Year 2018 being the first year where it looks like my 2 conditions for global cooling due to solar activity is taking place. This is why I am confident to say this year is a transitional year in the climate and no further global warming is going to take place starting with this year and moving forward. Thus far I would say the climatic trends are looking pretty good(this year) with global temperatures now running lower according to satellite data then a year ago thru this time, with overall sea surface temperatures cooling not to mention the North Atlantic in particular which is undergoing extensive cooling and is a very important area in the global climate picture. Also with the atmospheric circulation being less zonal. The other area is what is happening with the geo magnetic field in regards to it’s strength and orientation which when in sync with solar activity will compound given solar effects. In this case they are both weakening. The upshot of this is overall sea surface temperatures should drop and a slight uptick in albedo is probably going to happen due to an increase in global cloud coverage, snow coverage and an uptick in explosive major volcanic activity. My opinion. If one looks at the climatic history objectively it is clear that every prolonged solar minimum results in global cooing without exception. THOSE ARE THE FACTS NOT MY OPINION. Finally people are stuck on the false concept that the climate is going to change slowly and gradually which is false . That only being true when the climate is locked in a specific climate regime which had been the case after we came out of the Little Ice Age to present. This may now be changing in my opinion. @Goldminor said- Something has caused the surface wind patterns to undergo an obvious shift in patterns around 24 months ago. The 1500-year climate cycle is the millennial cycle whose peak effect is scheduled to take place next, at ~ 2180 AD. What should we reasonably expect from such cyclic occurrence? 1. Bigger tides and an increase in storm flooding events. 2. There should be an increase in Arctic sea ice and iceberg activity. 3. We should also see an *increase in zonal wind circulation and associated precipitation changes. Most of the effects could be smaller than in previous instances of the cycle if global temperatures continue at the current level or increase in the next 150 years. Any decrease in Northern Hemisphere surface temperatures caused by the cycle should be limited, and global average temperatures should not be reduced by much, probably not more than 0.2°C, as suggested by the standard deviation in a global reconstruction where its effect cannot be detected (Marcott et al., 2013; figure 37). Sandy, Salvatore – On Accuweather’s “news” articles, they have determined that Arctic ice is going decrease due to global warming. They aren’t very good at making weather forecasts beyond a 3-day period, so I view their prediction with a jaundiced eye. I have photos of a late-day sundog with ice streaming eastward out of it, just souith of me, so I’m inclined to only record what actually happens. Any forecasts by other people will probably be more accurate. Let me add solar irradiance plays a role in the sun’s ability to cool the climate but it is the secondary effects which are much more important. Those secondary effects being in increase in global cloud/snow coverage(due to a decrease is EUV light which in turn leads to a more meridional atmospheric circulation) , an uptick in major explosive volcanic activity( due to an increase in galactic cosmic rays, low AP INDEX /SOLARWIND),overall ocean cooling (due to a decrease in UV/NEAR UV LIGHT), and again a more meridional atmospheric circulation (due to a decrease in EUV light). All of this will result in cooling like it has each and every time in the past, and this time will be no different in my opinion. The additional factor is the weakening geo magnetic field which at the very least is going to compound given solar effects. AGW theory which is based on a house of cards. Not one of the basic premises this theory was based on seeing the light of day from a more zonal atmospheric circulation, to a lower tropospheric hot spot , to a distinct lessening of OLR radiation, to the climate in no way being even close to being unique, to CO2 following the temperature, to CO2’S climatic effects lessening as concentrations increase. Just some of the more notable problems with this theory among many others. “AGW theory which is based on a house of cards” drawn from a pack of lies. The next minimum (Leif’s artificial minimum) is not that close. Probably not before 2020. At the “full story” 1 very relevant comment on Stradivarius who must have known Maunder Minimum was not funny. Spot on Anthony, spot on. The problem arises from the variation in output activity from the sun, as the article explains; the existence of a sunspot does not imply the existence of a geo-effective impact, more importantly the absence of a spot does not imply the absence of impact. That from non-spot related solar activity can be just as important to the response of earthly atmospheric profiles as a significant CME impact. The article is rather ‘Euro –Centric’ principally because of available data. We also know that there is about 22 years long solar magnetic (Hale) cycle. Both sunspot and Hale cycles lengths vary by year or two from the above assumed ‘nominal’ values. These cycles influence on the global temperatures may be independent but the result because of the periodicity proximities is more likely to show as a cross-modulation. result gives values that are well known and widely acknowledged properties of the AMO, the Atlantic Multidecadal Oscillation, the fundamental component of the global temperature natural variability. Since no other source of the AMO’s periodicities has been unambiguously identified the above hypothesis clearly shows that the solar activity is primary cause of the global temperature’s natural variability. No, we don’t know that. That 'cycle' is composed of two overlapping individual eruptions of solar activity lasting some 29 years in total [and overlapping with other cycles at both ends]. Your last argument from ignorance is a well-known fallacy. You shouldn’t blindly believe everything you find on the internet. Especially not what is simplified too much. I am with Vuk on Hale. I can even predict rainfall patterns with Hale. Anyway. I have not even seen a graph here of the solar polar fieldstrengths. I thought we all agreed last time that 2014 was the beginning of a new GB cycle. Meaning cycle 25 = like cycle 17. I doubt that there will be a grand minimum. That would depend on the solar polar magnetic field strengths. Here is some speculation that is presented as a bit of fun. Please do not take it too seriously. 1) Sunspot pairs with a certain parity last of a period of roughly 17 years. 2) These sunspot pairs are identified as belonging to a given sunspot cycle. 3) The maxima of two consecutive sunspot cycles are separated by roughly 11 years. 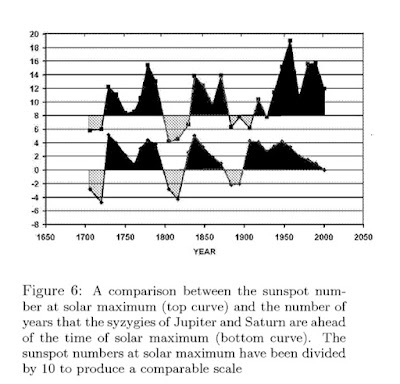 One of the original reasons that people proposed that the planets might be responsible for the sunspot cycle on the Sun was the near coincidence of the orbital period of Jupiter (11.86 years) with the mean long-term length of the sunspot cycle (11.1 years). Interestingly, the four dot points above can be used to extend that analogy a bit further. It would be interesting to see what happens when the two planetary periods realign (i.e. synodic period or half period of Jupiter and Saturn – call the Syzygies of Jupiter and Saturn in the diagram below). Do you think that there might be a connection? This is incorrect. The duration in time would be 2*11 = 22 years. So I don’t think much of your idea. I also find correlation for the Gleissberg cycle with certain planets’ positions after determining in various ways the turning points for the radiance caused by the GB cycle. Just remember that correlation does not yet mean causation. However, knowing the correlations of the planets with the sun[spots/ magnetic field strengths] might be useful in predicting what will happen on the sun next. I don’t see a grand minimum coming. Next on the list would be a grand maximum in the middle of the GB cycle. That would be a long time from now. You didn’t read the correction to point 4) of my post. It is indeed correct as it is just a restatement of what you said in a previous post. Are saying that you are wrong? That would be a first! Regardless, it was just [desperate] numerology. When making a claim, you should always address the question of ‘why?’. What is the mechanism behind the correlation [if any]? You don’t have to know the reason for correlation.Just that it exists will help you plotting a plausible course for the future. Isn’t that the same argument that we hear from CAGW advocates who see a correlation between global temperature rise and CO2 concentration, and therefore say that our plausible course for the future is that we must act to reduce CO2? It seems to me that Leif is right that we should be interested in the mechanism. We would want to establish causation before talking about plausible courses for the future, regardless of what correlation we may be discussing. Maybe I misunderstand what you mean by a plausible course for the future? By my results, there is no global warming. It already started cooling.Only fools who see the snow heaping up at later times in the year will still believe in the ‘data’ that are given//…. You’re deflecting. Obviously, I’m not making a case that CAGW sentiment (not theory) is correct. I’m agreeing with Leif that the interesting thing is to have a theory for the mechanism or how it really works. Just as you point out about the fact that CO2 correlates with temperature (with a lag) because CO2 solubility in sea water is a function of temperature. I only concentrated on the position of two planets and found correlation with the GB cycle related to my other results. Others have found correlations of other cycles with other planets, which I found astonishing. I cannot explain this. I don’t know if originally the sun put the planets in their place or if it is the balance of weight in the SS that has an influence on the sun. If somebody here does know I would be terribly interested in hearing their comments? Numerology? The journal Solar Physics does not seem to think so! The solar cycle appears to be remarkably synchronized with the gravitational torques exerted by the tidally dominant planets Venus, Earth and Jupiter. Recently, a possible synchronization mechanism was proposed that relies on the intrinsic helicity oscillation of the current-driven Tayler instability which can be stoked by tidal-like perturbations with a period of 11.07 years. Inserted into a simple alpha-Omega dynamo model these resonantly excited helicity oscillations lead to a 22.14 years dynamo cycle. Here, we assess various alternative mechanisms of synchronization. 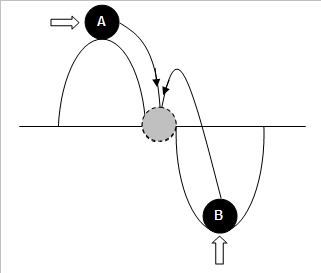 Specifically, we study a simple time-delay model of Babcock-Leighton type dynamos and ask whether periodic changes of either the minimal amplitude for rising toroidal flux tubes or the Omega effect could eventually lead to synchronization. In contrast to the easy and robust synchronizability of Tayler-Spruit dynamo models, our answer for those Babcock-Leighton type models is less propitious. Regardless of this speculation, the specific ‘theory’ that was peddled is still numerology. Let’s have another look at a possible Sun-Earth connection. The idea of AGW will probably never be dead until the last Zombie Alarmist has gone to his maker. The day when everyone sees the light isn’t comng, the future is now. Ecohippies are permanant, they are the ever growing lawn, full of hidden dog droppings, that must be perpetually mowed. We just didn’t mow enough. We know some stuff about the past, but not nearly as much as we’d like to. We know some stuff about the present, but again, we’re well short of what we need to really get to grips with most problems, in large part because the present is the product of the past, and therefore I think that it’s safe to say that we really don’t know very much about what the future holds, given that the future is a product of the present and the past. . . . I suspect! But speculating is fun sometimes and often our egos just sweep us away on a tide of guesses built on assumptions and hopes. . . . I believe that what we do actually know is dwarfed by what we don’t. The sun and the earth have a lot of secrets I reckon and I don’t think we’ll be cracking too many of their codes anytime soon . . . The amplitude of that in 24 is the same as in 23. From that the amplitude of 25 can be expected to be much the same as 24. Back to levels of the 19th century – not that that won’t be interesting with potential for mid-summer frosts in the Corn Belt. Thx for ur comment. However. I am with Leif on this one. If there is no extended minimum i.e grand minimum, I expect cycle 25 to be slightly stronger than 24. It will be similar to 27. This is after my finding a direct correlation with the position of Uranus and Saturn and the 87 year GB cycle. Sorry. Not 27. I meant 17. Trying to work on my phone with very small keyboard.. I don’t think that’s a sunspot group in the animation. I think it’s Phoenix droppings. A big gaseous fusion bomb, the Sun…. Really? Yeah, right. I’m sure you can see the problem. As a result, when someone like you comes along peddling that same brand of merchandise, you are likely to receive a less than warm welcome … nothing to do with WUWT, we’re just tired of ungrounded speculation masquerading as science. I get mocked for being reasonable and you say “someone like you… peddling”. Hmmm, nice. That’s way down on your pyramid. Given the piles ignorant certitude that get deposited here daily I’d suggest a little humble uncertainty might not hurt. zazove, I specified exactly what I objected to, the overuse of “can”, “could”, “might”, “may” and the like in making predictions of disaster … and I quoted the exact words where you were trying to sell us that same line of patter. Way up on the pyramid. I have no problem with error estimates and with acknowledgment of uncertainty. I do have a problem with claims on the order of “Sea level rise may drown Miami in the next three decades!”. That’s as far from “humble uncertainty” as one can get. In fact the ocean modes are in their warm phases during solar minima, which is what has occurred with the AMO since 1995. That is the misconception which is we should be cooling. The truth is we should have been warming due to solar activity through the end of year 2005. After that lag times have to be appreciated which are at least 10+ years of sub solar activity(which started in late year 2005) in general along with very low average value solar parameters within the sub solar activity in general. Those solar values being equal to or greater then typical solar minimum values between solar cycles and longer in duration. This year is the first year when one can say we should be cooling due to solar activity, and this is why I say the climate test is on from this year moving forward.. I maintain that the warming of the AMO since 1995 is acting as a negative feedback to the decline in solar wind pressure and temperature since then. Which is much different then trying to say it is due to AGW. I am puzzled as to why a comment of mine to Javier has gone in moderation? Henry I say global temperatures are still quite high we have a ways to go. Ja. Well. By my results it is globally cooling. Have you at least checked how much it is warming in your own backyard? Generally speaking when bodies attract and make orbits there is some interaction both ways. No matter how small the forces. But, yes. Correlation does not yet mean causation. I can only suspect that the planets might have an influence on our weather by pulling some switch on the sun. Henryp – yes it’s an interesting idea. Stars are just balls of gas. But I thought I remembered from childhood that the gravitational attraction of Jupiter is less than the bus going by you on the street. Gravitational force is given by f = G m1 m2 / r2 . I’ll assume a mass of 90kg for you (although it is irrelevant to the answer). How much energy do you use to push or pull a switch to put the big light in your house? It is in fact an electrical switch. People have made switches that turn on and off by a sound. That is the kind of switch that happens on the sun every 43 years. And we all know it is the planets who dunnit. Some very small gravitational pull or push. Amazing, actually. I know it is hopeless to educate you on this, but there is no such switch. Thanks, Leif … I saw henryp’s comment and though “A nice even steady 43-year ‘switch’ in the sun … riiiight”, but I didn’t have the heart to answer. We all know you believe in AGW. You calculated that and if it makes you happy I am fine with that. Man, that is dumb as a bag of ball bearings. I do NOT believe in AGW no matter what you think, that’s just the voices in your head. I think the greenhouse effect is real, but I don’t think that changes in CO2 will have any visible effect on temperature. Guess what? Today YOU found out that you are wrong. I am not sure now but I am happy to accept that this is your opinion; maybe you are playing devil’s advocate sometimes? I notice minimum T rising during a night when clouds move in, indicating some kind of ‘blanket’ action, i.e. earthshine being back radiated to earth by the clouds. However, at daylight same clouds now deflect a lot of sunshine, reducing Tmax, often by more than 5 degrees K, here where I live. I then asked you to provide me with a balance sheet, showing me what the net effect of the GH gases would be? In this article, Gerry Pease discusses a syzygy pattern that he compares to SC24, 25. It suggests to me that ssn for SC25 wont start increasing until July 2021. Further, it may not peak until 2027. Here is a thought experiment about a star and one planet. In this star there is a huge amount of hydrogen under very high pressure and at a high temperature. So the hydrogen exist as a plasma and all the protons are vibrating randomly at high speed because of the temperature. When two protons bump together in the right way they fuse and release energy forming a helium plasma. Now imagine we place a giant planet the size of Jupiter and in Jupiter’s orbit around this star. There will not be much of a gravitational force from Jupiter but it will bias the direction of the plasma gas molecules and consequently their chemical or physical reactions. That didn’t hurt to think about did it? True. That fits in with my thinking as well. To continue the thought experiment. Because the reaction is biased in the direction of Jupiter gravity there will be a hotspot that follows Jupiter possibly with a lag. Also a bulge in the sun surface will follow Jupiter. There will not be much of a gravitational force from Jupiter but it will bias the direction of the plasma gas molecules and consequently their chemical or physical reactions. This is a common misconception. Actually, there will be zero “gravitational force from Jupiter”. A star and a planet in orbit are no different than if they were both moving through empty space, with one exception—tidal force. This relates to the difference in gravitational pull between the near and the far side of the sun. HOWEVER, and it’s a big however, as Leif points out, the tidal force of Jupiter on the sun raises a tidal bulge that is all of 0.2 mm high … and if you think that will make a difference at the turbulent surface of the sun, go to the back of the class. See my post Canute Ponders The Tides for further information on this subject. Quite frankly, your sample has to cover the whole earth to give you an exact global mean. The sats are also not to be trusted as there have been many problems and I can see that whenever a problem arose (new version) they re-calibrated on GISS. However, if GISS is also not right, due to imbalance/ & human adjustment, what have you got? The global mean is almost impossible to predict as it depends on too many factors. If you believe AGW is true: check minima and find that there is no increase in global minima. And find that the energy we get from the sun has already been declining. When will the global mean be affected? I suggest you evaluate the amount of snow in front of your door at the same date relevant to you each year. @Leif- Thank you for your comment. Now imagine Jupiter and Saturn and Earth all in zyzygy on the same side. The Bulge might be a tad bigger, and the hotspot a tad hotter, huh? @Leif- What about the hotspot? A plasma reaction rate based on random thermal collisions will surely increase with the gravitational bias field, no matter how small, resulting in more radiated energy from the bulge. The fusion takes place in the solar core and it takes 100,000 years or more for the heat to leak out to the surface, so any variation much shorter than that [Jupiter 12 years…) will be completely washed out. So, no increase that can be observed. Speculating, this process seems to me related to the pulling of an electrical switch on the sun, To pull this switch you just need some additional gravity? @Leif- So, can you imagine any way this affects the tachocline interface or reactions and events outside the core? You have the knowledge and resources to check this out. If the zyzygy was between Jupiter Venus Saturn Uranus and Neptune it might be larger and more detectable. It would be a good paper for you to disrupt all the previous thinking. It would be a good paper for you to disrupt all the previous thinking. The problem is that the outer planets move too slowly. The Sun rotates in 25 days so your ‘hotspot’ [caused by almost stationary planets] is smeared over all longitudes and completely washes out. This is in addition to the negligible tidal effect to begin with. So, no glory to be gotten from that. The planetary enthusiasts prefer the idea that the Sun sloshes around the center of gravity of the solar system, but ignore that the Sun is in free fall and thus does not feel any forces [like an astronaut in orbit]. There are many planet systems known and they do not show any effect of the planets on their star. You might enjoy http://www.leif.org/research/AGU%20Fall%202011%20SH34B-08.pdf on this subject. @Leif- For example, could it modulate some parameter of the tachocline interface which would show up at the surface faster? Same problem as before: the sun rotates, so the hotspot [no matter where it is] will be smeared all over the place, erasing any signal due to the almost stationary planets. @Leif said- Sun rotates in 25 days so your ‘hotspot’ [caused by almost stationary planets] is smeared over all longitudes and completely washes out. OK, most of the time the effect would be smeared, but when significant mass planets are in zyzygy, or approaching it, that could have an effect for several solar rotations, i would think. Thanks for link, i can read tomorrow. The biggest effect would be from Jupiter and Venus and the Earth [Venus+Earth has more effect than Jupiter]. The big outer planets [S, U, N] have effects hundred of times smaller. The varying distance between the Earth and the Sun [we are closest in January] has an effect about a hundred times larger that of any solar activity [caused by planets or otherwise], so that alone washes out any planetary signal. I subsequently found that the solar poles move over twice at these times – going by the south and north solar magnetic fields, e.g. 1927, 1971, 2014. Help me with your terms please. my physics is very rusty and when I did this stuff my score usually was below 50%…. I do remember that it has to do with electricity, normally, the dead end stops happen at certain binomial functions coming suddenly to an end at a certain top or bottom, and from then move in the exact opposite direction, also binomial, forming a mirror image with the first function. In its turn, the dead end stops can usually be related to the top and bottom of some other related sine wave function…. @HenryP- OK, sounds like something undergoing phase change. Also i noted 43 yrs is close to 2 Hale cycles. So we will study this more, and i will read Leif’s pdf. True, every Hale cycle makes one quadrant of the GB cycle. Note that what I explained earlier to Javier. I am trying to figure out as to why this happens just knowing that if it does not happen every 43 years there could be a problem…. So, does January have more sunspots or higher F10.7 than other months? No, but we are closer to the Sun. If you sit in front of a fire you feel a certain heat. Move further away and you feel less heat. Move closer and you feel more heat. Same thing with the Sun. This effect is MUCH larger [like 70 times] than any possible effect from solar activity. @Leif- okay then. Thanks for the enlightenment. Back to the drawing board and wishing well, heh. Summers in the northern hemisphere are about 4°F warmer than summers in the southern hemisphere due to the high heat capacity of the southern oceans, and also the northern summer is 2 to 3 days longer than southern summer as our orbital speed slows. You also have to consider the timing of the sequences of the advecting weather systems. @ Leif, Willis- I finally figured out what you’re talking about when you say freely falling. I heard about this concept long ago but hadn’t reconsidered until I reread it in Wiki. The earth is literally falling towards the sun under its immense gravity. Despite the thousandfold difference in mass, due to the relatively large distance between them, the barycenter is outside the Sun. The barycenter is one of the foci of the elliptical orbit of each body. Note that the Sun–Jupiter system, witheJupiter = 0.0484, just fails to qualify:1.05 0.954. * So now I have also remembered about the barycenter. And looking at some of the diagrams it seems the sun must be accelerating and deccelerating as it moves around the barycenter. Surely this must have some effect that we can measure on the outside? Uh, also what is the common joke about the 43 yr switch? No. Think of an astronaut in an elliptical orbit around the Earth. He is also changing his speed all the time [speeding up when getting closer to the sun, slowing down when moving away], yet he feels nothing, being in free fall. The Earth is in an elliptical orbit around the sun, but neither the sun nor the earth feels the change of speed. An astronaut in a circular orbit around the earth is accelerating all the time [changing direction – deviating from a straight line – is also acceleration] yet neither he nor the Earth are affected. If the massive sun moving around the barycenter would be affected, how much more would the much smaller planet also moving around the barycenter not be affected? The lunar laser ranging measurement data shows the accuracy of Newton’s gravitational constant G to one part in ten trillion per year. The likelihood of any “Nordtvedt effect” has now been ruled out to high precision, so now we can have full confidence in the Strong Equivalence Principle. @Leif, Willis, Somebody- any constructive comments, critique, of Charvatova’s work on barycenter cycles relating to solar minima? Thanks for that. I’ll look in another corner, heh. @Leif, Willis, Anybody- the image on the page suggest this looks like a giant Hadley cell. The thing I’m curious about is does the 40-year cycle show up on Earth weather cycles also. Another article said it flows about 30 kilometers per hour at Peak Sunspot Cycle but speeds up to 50 during the quiet spell. Also does it have some characteristic name like the Hadley cell. And does it rotate W to E? Just as Earth’s global ocean circulation transports water and heat around the planet, the Sun has a conveyor belt, called the meridional plasma flow, in which plasma flows along the surface toward the poles, sinks, and returns toward the equator, transporting magnetic flux along the way. It has two branches, north and south, each taking about 40 years to perform one complete circuit. The upper belt skims the Sun’s surface, sweeping up knots of solar magnetism (decaying sunspots) and carrying them toward the poles. The structure and strength of this meridional flow is believed to play a key role in determining the strength of the Sun’s polar magnetic field, which in turn determines the strength of the sunspot cycles. It has two branches, north and south, each taking about 40 years to perform one complete circuit. Not true. Old fake news. The circulation is shallow and completes in 16+ years. We know this from two pieces of evidence: 1) direct measurements of the circulation at depth, and 2) the polar fields predicts the next cycle so the circulation time must be short. @Leif- Thanks for that. Fake NASA news haha. So if these currents are rising up to the equator and flowing to the poles and down and coming back to the equator then by the right-hand rule they both make north magnetic poles pointing in. What is this going to do. Hmmm. Do these currents have a popular tag name like the sweeper currents? Do these currents have a popular tag name like the sweeper currents? The meridional circulation. The ‘conveyor belt’. And the current is a matter current [moving materiel stuff, like a river], so not an electric current, so the right-hand rule does nit apply. It is more complicated than that. “Abrupt onset of the Little Ice Age triggered by volcanism and sustained by sea-ice/ocean feedbacks,” Gifford H. Miller et al, GRL (2013). @David Appell- you really believe CO2 causes climate warming, when all it has to show for 300 yrs is greening? This is wrong. The climate cooling came first and caused the earth to shrink, increasing pressure on magma, and spinning faster, increasing centrifugal force on magma, thus causing more eruptions. Plus the effects are not long lasting, one to three years. According to wiki, Pinatubo eruption in 91, a VEI6, lowered global temp by 0.5 dgC until 93. Two years of cooling. I have posted the following alert to several sites and to a US senator. Links to the 18 articles i read are available by request in comments. Most from Climate,etc, and WUWT. The MsM and warmist alarmists are wrong. It is the heighth of hubris and arrogance to think humans, in the space of 150 years, can change thermal cycles that are thousands of years long and have existed for millenia. The thermal mass of the land and oceans is enormous. The temperature of deep, still, parts of the ocean have barely risen one degree in 22,000 years, the last glacial max. My reading of the climate tea leaves says we’re already past the interglacial plateau of relatively stable climate. For the last three thousand years, Since 1000 BC, the end of the Minoan Warm Period, the global temperature trend has been -0.5 to -0.7 dgC per 1000 yrs, projecting full glacial of 8 dgC in another 7,000 yrs. Another clue, the obliquity dropped below 23.5 degrees around 1300 AD, the onset of the Wolf Minimum. Now the glacial cold lurking in the deep ocean, held in check by obliquity for 10,000 years, has been set free, ending the Holocene Interglacial. We are in the transition zone to glacial cold, expect Finoscandian ice sheets to start in 2000 yrs. Up until two weeks ago I was thinking we are coming into a grand solar minimum. But I’m reconsidering that after rereading some articles on skeptic climate blogs. I now believe we entered a ‘Micro- IceAge’ in 2004 when Bob Weber’s fig.10 showed a drop in 10.7 cm solar flux, leading to ocean cooling. I’m calling this a ‘Micro’ because I don’t expect it to last more than solar cycle 24, 25, and 26. Then there will be maybe 7 years to transition back to normal global temperatures; say by 2050. What the mainstream media is not highlighting is this last winter was the coldest in 40 years in many countries in the northern hemisphere. North Western European countries on the Atlantic coast reported last summer was the coldest in 40 Years also. Also this spring has been cold and longer than usual which will affect the growing season. During the Little Ice Age the temperature dropped about half a degree globally. As you can see from the Delingpole essay, it has dropped by 0.56 degrees already. This is what we can expect starting from last Dec; some winters extremely cold, some wet cool springs to kill crops, some cold summers, and more frequent and severe storms. The storminess index went from 6.5 to 14 during the LIA. This slide into cold is showing up in German weather station records where the last 30 yrs of winter (DJF) are trending -19 dgC per 1000 yrs, much faster than the slow decline to normal glacials. I expect in the next ten years one billion will actually starve due to crop failures*, and one billion will be eaten by stronger omnivores; feral dogs, cats, and … humans. As the legal beagles like to say, ‘Time is of the essence,’ so the sooner you act, the better your chances of survival. *NB- the WHO reports 800 mln suffer from hunger, 10 mln die from starvation each yr, 60 mln die from disease each yr. So now thats 70 mln / yr, plus more food stress, weakening immune system, more disease, amplified by cold climate / storm stress, could easily be 100 mln /yr … Thats 1 Bln / 10 yrs. @David Appell said- because they accept and communicate the AGW consensus. No way is ‘consensus’ science. Like 97% say the earth is flat. Ha ha ha ha … You dont vote on facts! Well, let’s see. I’m not banned at RC, they just censor people’s scientific opinions that they don’t like. Now, Anthony should be the one to answer this, but as far as I know, nobody has ever been banned from WUWT because “they accept and communicate the AGW consensus”. Now you certainly can get banned for violation of site policy, and people have been. But that’s true on every site. However, I know of no one who has been banned for “accepting the AGW consensus”, and I see lots of folks commenting here who do just that. That said, I’m just a guest author, not a moderator, so Anthony would be the one to ask. @Leif said- And the current is a matter current [moving materiel stuff, like a river], so not an electric current, so the right-hand rule does nit apply. It is more complicated than that. I bet it is more complicated. Matter at 6000 degrees? Do you have a link to a PDF? @Anybody- is there a ground station located between 65 and 70 north that measures the incident solar radiation? I’m looking for a chart from 2000 to see if we’re getting way below 500 watts per meter squared and preparing for the next ice age. @All- this document showing ground Station solar installation. It looks like one chart shows a cooling trend from 2000 of about 4 watts per meter squared per decade. So after this micro Ice Age We may just keep stair stepping down for the next four thousand years. Stay tuned. indeed, my results do show that it already started globally cooling. I did not know there was somebody else as well who saw this.. Anyway, the cooling it is not so much. and we have started to cycle up again. It means it will get warmer again, about 20 years from now. So, I don’t think you have to worry much. We are about 0.2K down since 2000, on average, for an observer standing and measuring on the equator.